This year’s Chiang Mai Grand Sale started with a big bang online! is on sale, all proceeds go to the Elephant clinic. All too often we find ourselves complaining that there really is nothing interesting to do and end up camped out in front of the television watching reruns of Law & Order. It’s easy enough to overlook the abundance of things to do around Chiang Mai as we say, “Oh, that’s so touristy.” But the fact remains that those creatures, the tourists, are few and far between these days and local attractions can be very attractive for those residents who do not like to confront the teeming tourist hordes of high season. “Elephants are sensitive, intelligent creatures. They are “jai dee”, they have a good heart, they are like my family now” says Wassana Thongsook, owner of Mae Taeng Elephant Park. Mae Taeng Valley is one of those places that people often forget. 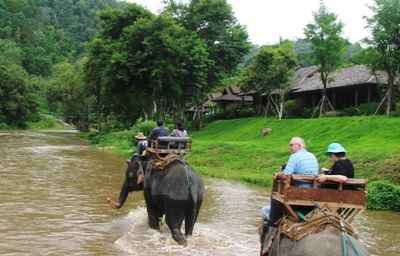 Not only is it home to an abundance of elephant camps, but there is ATV riding (quads as they are also known), rafting, oxen cart rides, jungle walks and more. Owners and operators must still feed their elephants and pay their mahouts, with costs at a minimum of a 1000 baht a day per elephant, it’s not a small endeavor. Take a drive up to Mae Taeng, ride an elephant, raft the river, ride an oxen pulled cart, four wheel it on a quad. Get active and support your local businesses at the same time. Schools get a discounted rate for their students and it’s a terrific way to introduce the kids to the majesty and intelligence of these animals. As can be seen by the childrens’ faces, it’s an experience they are unlikely to ever forget. Additionally, you can help support the Elephant clinic. On land generously donated by the owners of Mae Taeng Elephant Park Wassana Thongsook and her family, the independent clinic hopes to be able to treat all the estimated 500 elephants of Mae Taeng valley for free. Currently, injured elephants must travel at least 3 hours to Lampang (you have to drive slowly when you’ve got an elephant in the truck!) for x-rays and scans. A government livestock vet with extensive elephant experience comes to the clinic after work and on weekends but once it’s up and fully running they plan to have at least one full time vet. 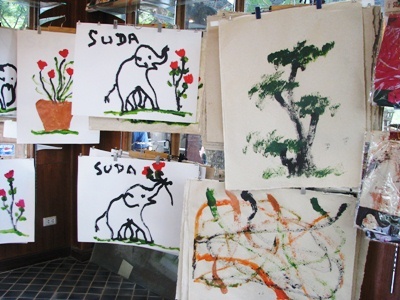 Elephant art is on sale at the Mae Taeng Elephant Park but all proceeds of those sales go directly to the independently run clinic which is currently raising funds to purchase a CAT scan and an X-ray machine. Where one finds an elephant sized CAT scan is a good question! Sally Ward, who has been working tirelessly to raise funds for the clinic says, “The web site was set up with the sole purpose to educate and generate funds. 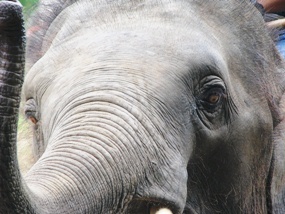 We hope that in the future money can then be donated to other elephant foundations. But for this to be a success we need the general public to buy the products, book elephant excursions in the region and support the few elephant foundations that are already up and running. We need to help them raise awareness and give a better life to the Elephants living in Thailand. Visit www.chiangmaiele phants.asia for information on how you can help these intelligent animals who have given us so much and yet received so little in return. Elephant rides are a bumpy way to travel but an experience not to be missed, nonetheless. 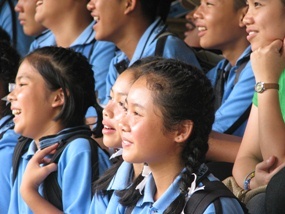 Chiang Mai Grand Sale 2010 started online on July 1 and is offering tourism products and services. Visit http://www.cm-grandsale.com for details. Vorapong Muchaotai, Secretary General & Chairman of Marketing & Promotion of Chiang Mai Tourism Business Association announced that the regular in store sales will be held July 17 and 18 while the online sale will continue to the end of August. Chiang Mai Governor Amornphan Nimanant, Chalermsak Suranant, Director of the Tourism Authority of Thailand (TAT) Chiang Mai Office and Chiang Mai Provincial Administrative Organization (PAO) President Boonlert Buranupakorn are expected to preside over the grand opening ceremony on July 17. This year’s two main events are jointly organized by the Chiang Mai Provincial Authority, Chiang Mai Chamber of Commerce, and Chiang Mai Tourism Business Association, TAT Chiang Mai, Thai Hotels Association’s Northern Chapter , Chiang Mai Guide Association , Thai Lanna Spa Association, Car fore rent Club, Chiang Mai Food shop and Restaurants Club, Boutique Hotels Club, and Golf Courses Operators and Tourism Allies club of Chiang Mai. The event is expected to draw not only visitors but also good sales via the new online site. The Legend Chiang Rai has created an alternative source of income. 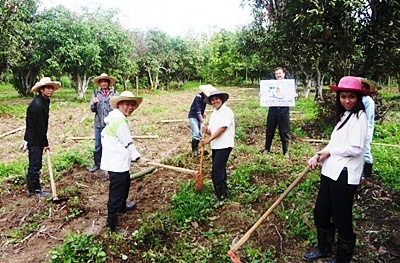 At the resort’s other plot of land staff “Phuen Team” is growing fruit and vegetables such as passion fruit, pineapple, bananas, lychee, mango, lemongrass, green beans, mint, sweet basil, ginger and sweet corn. Not only does it create an additional source of icome for the hotel it reduces operating costs by providing fresh herbs, fruit and vegetables. In addition it motivates the staff as all departments participate. Everyone is looking forward to harvest their own home-grown fruit and vegetables.